It was in the Museo Marítimo in Bilbao one week ago. Jaime Izquierdo and Felip Verger, the two all-things-surfing-entrepreneurs from Golfo Atlántico at the entrance door waiting for us. We came a little late. Construction in Bilbao and out of date GPS maps do not like each other. At the entrance door to the right: a poster with a promising key visual and the headline: 1912 – 2012 Exhibition A Century of Surf. The pic on the poster was one of the most iconic surf pics taken in Spain: it showed the magical left of Mundaka back in the 1980s. Jaime and Felip are the curators of the most comprehensive exhibition about surfing history in Spain. From the very first beginnings in the early 1960s to the latest developments of the Basque Wavegarden project the exposition shows a vivid culture growing over the last five decades. “One remarkable fact about the birth of surfing in Spain is that it did start more or less simultaneously at different spots in different regions. At the beginning the pioneers didn’t know each other, they did their own thing no matter if it was planking or the surf with poorly done homemade plywood boards”, Felip sums up the very start for us. Foam for proper boards and shaping know-how were a scarcity back then. Wetsuits? If there was something you could call a wetsuit then it was a thick diving suit. Besides tons of fantastic archive pics, stories from witnesses and facts about the evolution of surf and surfboards and also the whole competition thing there was another intriguing and sticky part in the exhibition: Jaime was collecting and recovering original surf footage from the 1960s until now over a period of many months. It is the ordinary people’s videos they put together into a ramble through the best waves of the early surfer’s live. 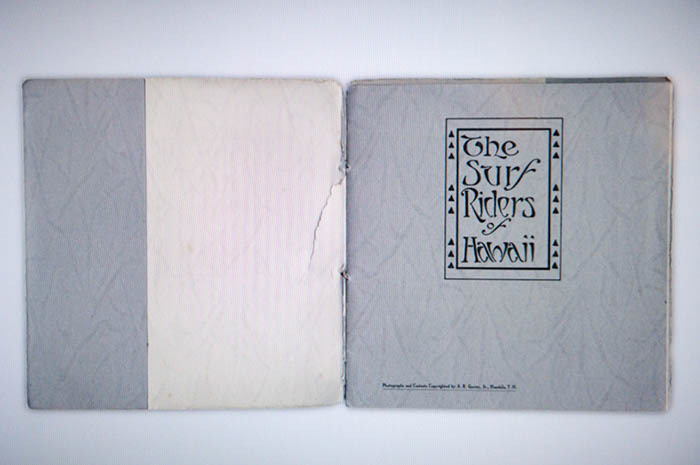 You might have regognized that the exhibition announces 1912 – 2012 Exhibition a Century of Surf. But above we were just talking about the 1960s to be the pioneering years. So how come? If you dig deep in surfing’s history book you might come across a Señor Ignacio Arana, consul of Spain in Hawaii, who is said to have taken back home a surf board and the book “The Surfriders of Hawaii” that marked the very first surfing experience. Strolling around in the exhibition for a few hours, we figured that Jaime and Felip did a great job. If you have the chance you should rather visit the museum!